One thing that a person needs to look at when they are choosing a bathroom vanity is the amount of storage that is needed. Most people like to get as much storage in the house as possible, but without encumbering the room. The vanity storage can be organized in such a way so as to make it easy to get to items that are traditionally stored under the vanity or in the drawers. This includes shampoos, soaps, hair items and toilet paper as well as just about anything else that a person might expect to find in a bathroom. 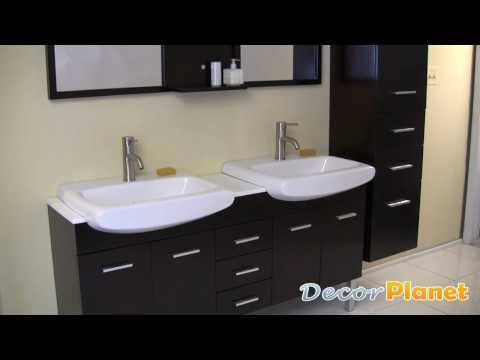 You should look at the size of the bathroom as well as how much storage space you need when choosing bathroom vanities. For the small bathroom, such a powder room or guest bath, a small bathroom vanity will work well and also give more space in the room. You do not want the vanity to take up the entire room as this makes the room look smaller and more cluttered. If you have a bathroom that is used by several people, however, such as a family bath, then you want to be sure that you use bathroom vanities that will enable you to provide adequate storage. In some cases, there are compartments in the vanity that can pull out. This makes for easier cleaning as well as organizing in the unit. Most people dislike the idea of having everything cluttered in the bathroom. They want to find a vanity that will enable them to have enough storage for the room but also have it so that they can reach everything as needed and have the items well organized. Storage issues aside, the look of the product is something also to be considered. Many of them are made of real wood. Some are made of particle board. Those that are made of particle board tend to be cheaper, a lot cheaper. They do not last as long as those that are made from solid woods, however. But when it comes to first appearance and for strictly cosmetic detail, the wood composites will look just as good as the solids when installed. Anyone who is looking to fix up a house and then perhaps sell it or rent it out can get a quick facelift in the bathroom by getting a cheap vanity that is made from particle board. This will give the desired cosmetic effect that a person is looking for but for a lot less money. Those who are looking to stay in their homes and want something that will last a bit longer should go for the solid woods. Going online is the best place to find these products. You have to measure so that you know what size you are looking for. This type of venue can be used by those who are doing the work themselves such as a do it yourself person, or even contractors who are doing the work for someone else. These products can then be ordered and shipped right to where they have to be for a lot less than the prices that are offered in the off line stores. that will fit your room, go to Home Design Outlet Center.